Have you reached veggie overload yet? You know, that moment in the summer when you look in your refrigerator and think, “how are we ever going to eat all this?” I’m not quite there, but I am ordering light on our produce box this week so we can catch up with what we already have. I’ll also be taking time to can and freeze some of our summer bounty for the winter. 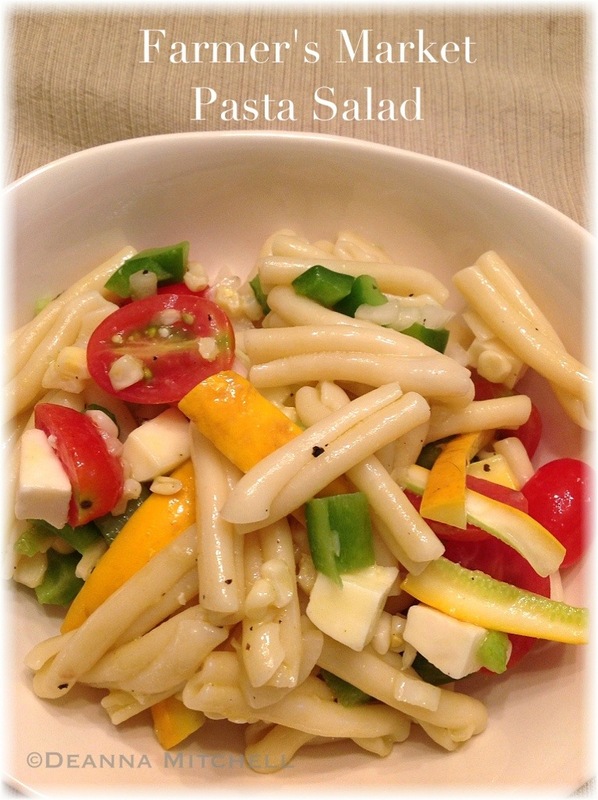 This pasta salad recipe is great because it addresses two summer issues: it uses pretty much whatever vegetables you feel like bringing home from the farmer’s market (or have in your refrigerator) AND it does not require a lot of cooking, so your house will stay cool. It could easily be called “clean your refrigerator pasta salad” because that is what I did. This salad is fresh and light, but also filling. We used a pasta new to us called casarecce. It is chewy and substantial, but also fun-looking. We bought the Giada DeLaurentis brand from Target because it is organic (and was on sale). It was very good. You could use butterfly pasta, macaroni, dinosaurs or whatever shape suits you. We ended up using the last bits of local mozzarella and local smoked cheddar from a recent farmer’s market run. The smoked cheddar was especially great! Will definitely do that again! You can make the vinaigrette dressing as it is here or you can substitute a white balsamic or rice wine vinegar. The peach vinegar was pretty terrific, but if you can’t find it, use what you have–no biggie. This is all about flexibility and creativity so use this recipe as a base and make it your own! In a large stock pot bring water for pasta to a boil. Cook pasta to al dent according to directions. While pasta is cooking, combine all chopped vegetables in a large bowl. In the bowl for a stick blender (or in a standard blender), combine vinegar, oil, mustard, honey, salt and pepper and blend well. Set aside. Drain pasta and add to vegetable mixture. Add cheese. Pour dressing over all and toss well to coat.